You know that your son is a true blogger’s child when he stops to pose as soon as he sees a camera. 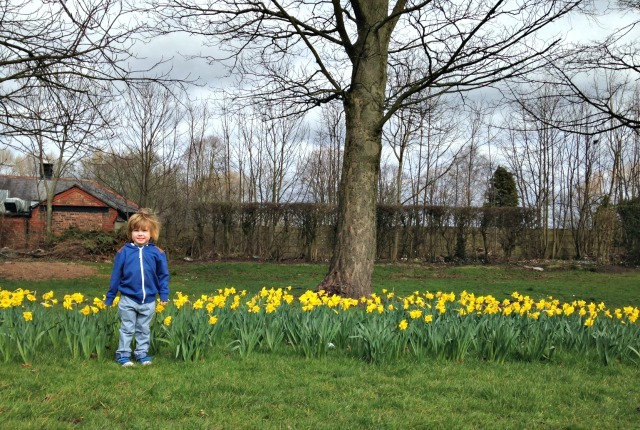 He was happily wandering around the daffodils until he spotted me; when he turns and smiles so beautifully how can I resist? These daffodils have suddenly sprouted up on our school run and although it most certainly doesn’t feel like spring at the moment, they do brighten up our walk. I’m dreaming of summer days, when we can leave the house without coats and I can put sandals on little feet. Please let the warm weather come along soon!